YOU’RE LIVING YOUR DREAM. NOW YOU CAN DRIVE IT TOO. YOU’VE GOT THE ACREAGE. WE’VE GOT THE TRACTOR. 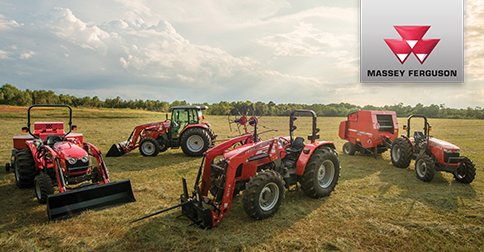 Massey Ferguson has reinvented what compact tractors can be. Redesigned what they look like. And redefined what they do. Making them easier to operate. More comfortable to drive. More versatile than ever. And just right for you. You always dreamed of owning your own land. To make it perfect, you need just the right tractor — at just the right price. FILL OUT THE FORM TODAY TO HAVE AN OHIO AG EQUIPMENT SALES REP CONTACT YOU ABOUT A CUSTOM QUOTE. Think of the Massey Ferguson GC1700 Series as the Swiss Army knife of compacts, offering bigger tractor features in just the right size. With up to 25 gross engine horsepower and unmatched versatility, these easy-to-drive, multi-tasking workhorses can handle everything from mowing, loading and backhoe work to snow blowing and more. So if you’re ready for a real tractor, check out the GC1700 Series. It’ll give you all its got—and then some. If you’re looking for a compact that’s a no-nonsense workhorse with up to 38.5 gross engine horsepower, the Massey Ferguson 1700E Series is the tractor for you. Simply put—we’ve gone back to the basics to help you come out ahead. 1700E models feature a 540 RPM rear PTO and Category 1 3-point hitch as standard equipment to power a wide variety of mounted or towed implements. Combining the practicality of a compact tractor with the functionality of a utility tractor, the versatile 2700E Series is ideal for loader work, rotary cutting or any other rear PTO job that needs doing. And while these easy-to-operate tractors combine just the right mix of modern-day innovation, value and comfort, at their core remains the heart and soul of their founders. Utility goes heavy-duty in the new 4700 Series. These tractors are built extra tough to handle bigger jobs with added stability and comfort. It’s also built to be easy to use and comfortable to operate. From the ground up, these tractors are engineered for smart, ergonomic, long-lasting operation. Because even though the work is tough, your tractor should never be hard on you. Complete the form or stop by any of our Ohio Ag Equipment locations today to talk to someone about a custom quote. Click here to find an Ohio Ag Equipment store near you. *0% for 72 months financing and published payment amounts are subject to credit approval. Offer subject to machine availability. Models, work tools, and configurations shown do not necessarily reflect the exact model configuration used for promotional pricing. Payments do not include tax, freight, set-up, delivery, document fees, inspections, additional options, or attachments. Delivery charges may apply. Offer subject to change or cancellation without notice and additional terms and conditions may apply. Contact Ohio Ag Equipment for details.